Iguazu - visit from Argentina or Brazil? 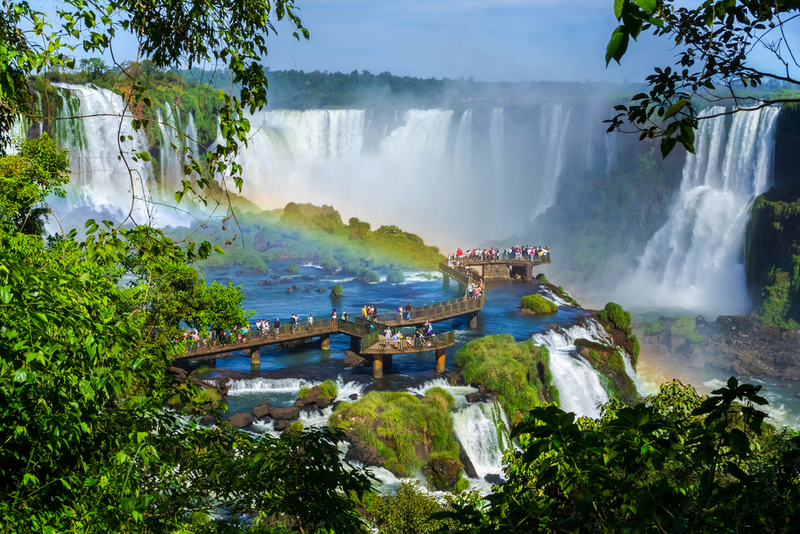 Iguazu – visit from Argentina or Brazil? The Iguazu falls are the largest waterfall system in the world, and are fed entirely by the Iguazu River. The name ‘Iguazu’ actually comes from the native Indian language, with ‘y’ meaning water, and ‘ûasú’ meaning big, a pretty apt naming system. 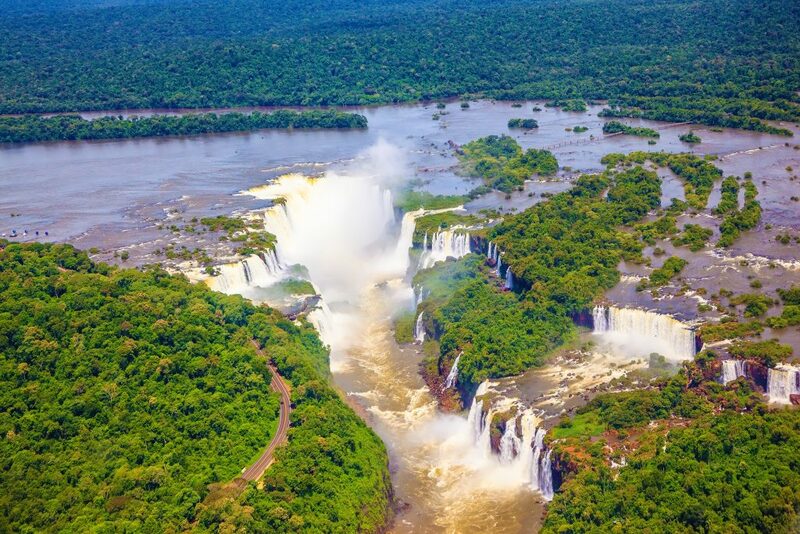 The waterfalls are situated on the border between the Argentine province of Misiones, and the Brazilian state of Paraná, and can be reached by two main towns, Puerto Iguazú in Argentina, and Foz do Iguaçu in Brazil. What’s more, the falls are actually shared between the two countries Iguazu National Parks. This begs the question, which side is the best side to explore, and of course view, the Iguazu falls. The answer is still very much up to debate, and completely depends on what aspects you care about most. This is why we have compiled all our Iguazu information, so you too can make up your mind on the best side of the Iguazu Falls. Most of the actual waterfalls are on the Argentinean side, meaning you will get a much more up close and personal experience of the waterfalls from Puerto Iguazú. The Iguazú National Park on the Argentinean side is also much larger than that of its Brazilian counterpart. If you prefer a bird’s eye view of the waterfalls then this is definitely the side for you. With the many boardwalks stretching right out over the falls, you can almost reach out and touch the plunging cascades of water. The aerial view definitely gives you a better idea of the sheer size and magnitude of these beautiful waterfalls. Also, the Argentinean side is said to be the place to see the single or double rainbows forming over the waters. Probably the most famous waterfall of all the Iguazu is the Garganta del Diablo, or Devil’s throat, and from the Argentinean side you can practically walk into the heart of its mighty cascade. The Devil’s throat walk will take you right out to the brink of the waterfall, allowing you to look down the entirety of its majestic falls. Getting into and around the park is extremely easy on the Argentinean side. They have a train system with three major stations; Estacion Central, at the entrance of the park, Estacion Cataratas, for the lower circuits, and Estacion Garganta del Diablo, for access to the Devil’s throat. Once you are at each stop, the Argentinean side is also very pedestrian friendly, as it has great walkways that cover the dirt and gravel paths. If you are travelling with someone with mobility restrictions, or young children, then this side is definitely more equipped for your needs. Boardwalks on this side are much longer than over on the Brazilian side, allowing you to get extremely close to the vast network of waterfalls. 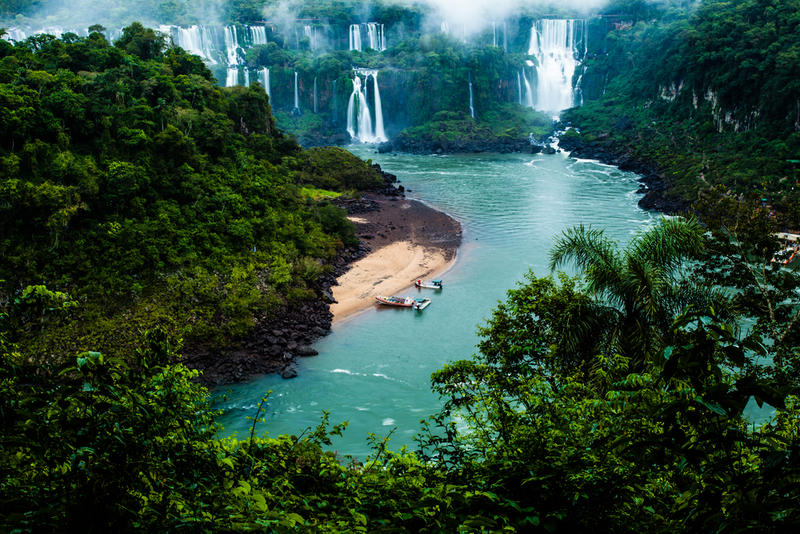 The Iguazú National Park in Argentina seems to be much more focused on eco tourism, and environmentally friendly activities, so you won’t find some of the more extravagant activities you can find on the Brazilian side here. However, you can take a boat ride directly under the most popular waterfall of Iguazu, the Devil’s Throat. On This side you can also enjoy an invigorating rappel from a platform stationed on the edge of the Iguazu river, get a total adrenaline rush from zip-lining through the jungle, or enjoy a relaxing river boat ride, that will take you to see all the amazing wildlife in the surrounding rainforest. Unique to the Argentinean side is the Coati sightings on the catwalks, and the vast number of butterfly species found in the surrounding jungle. For most of its course, the Iguazu river flows through Brazil, however most of the waterfalls are on the Argentinean side. Furthermore, the Iguaçu National Park of Brazil encompasses a much smaller area than that of Argentina, and so in general you get much more distant, and picturesque views of the falls. The Iguazu falls from the Brazilian side. For those postcard worthy, panoramic views of the Iguazu falls, the Brazilian side is definitely the one to choose. Because with the grand network of 275 waterfalls, spanning an area of over 3km in width, you can get a 360° views of the breathtaking Iguazu. So, for all the photographers out there, it’s virtually impossible to take a bad photograph of the waterfalls over on the Brazilian side. In addition to those amazing panoramic views, you are also able to get a close up view of the famous Devil’s throat, by walking out onto a special board walk. Unlike the Argentinean side’s view of this epic waterfall, you don’t look down on the cascade, you actually look up. This unique view really enables you to see the true power behind this waterfalls vast cascade. If you are more of an outdoorsy person, and you like to take strolls through nature, then you will love the leisurely 40 minute hike up to the falls on the Brazilian side. Although the hike is long, it isn’t strenuous, and has very minimal steps, so it is safe and fun for all ages. If hiking isn’t for you, or if you struggle with mobility, then fear not. There is a double decker bus that will take passengers right from the entrance of the park, to an elevator close to the Iguazu, which in turn, will take you right down the falls themselves. Helicopter ride over the Iguazu falls. Photo credit: Shutterstock. As Foz do Iguaçu is a little more developed than Puerto Iguazú in Argentina, there are more activities offered on the Brazilian side. 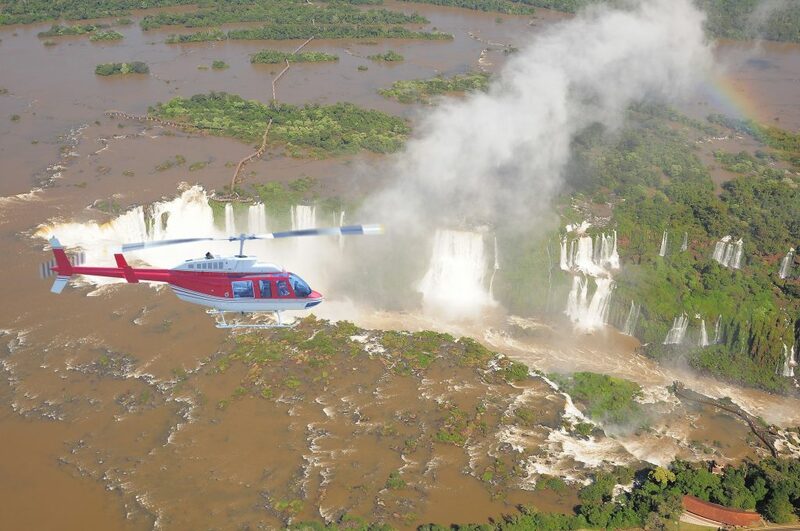 You have the opportunity to see the amazing areal views of the Argentinean side, by taking a helicopter ride over the whole network of Iguazu falls. You can also take a speed boat tour up to the cascades of the waterfalls, and enjoy a river cruise or jungle tour from this side. What truly sets the Brazilian side apart from the Argentinean side, in terms of activities, is that it also has other parks available. You can pay a visit to the Parque das Aves, a wonderful bird park that is home to over 200 fascinating and beautiful native species. You can also take a trip over the Friendship Bridge to Paraguay for some shopping or to visit the impressive Itaup Dam. Chimu Adventures offers a variety of tours to South America that can include a visit to Iguazu. Click here for the possibilities.